Mars One announced Monday (Dec. 30) that it has picked 1,058 aspiring spaceflyers to move on to the next round in its search for the first humans to live and die on the Red Planet. The Netherlands-based nonprofit wants to start launching groups of four on one-way trips to Mars by 2023, with the long-term goal of creating the first permanent settlement on Mars. More than 200,000 people applied for a spot on Mars One's list of future colonists by the time the initial application window closed on Aug. 31. The only requirement to apply was to be over age 18. Those who get to move on to the next, more rigorous selection phase were notified by email. Of those who made the first cut, 297 are from the United States. Canada is the second best represented country with 75 candidates, followed by India with 62 and Russia with 52. All told, Mars One is looking at applicants from 107 different countries, according to figures released by the group. Nearly 77 percent of the people who made the first cut are employed, while about 15 percent are still in school. About 55 percent of the applicants are male and most are quite young: 357 are under 25 and 415 are under 35, while just 26 are over 56. The oldest person to make it to the next round is 81. 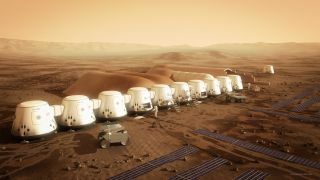 "The next several selection phases in 2014 and 2015 will include rigorous simulations, many in team settings, with focus on testing the physical and emotional capabilities of our remaining candidates," Norbert Kraft, Mars One's Chief Medical Officer, said in a statement. Mars One officials have said in the past that they plan to broadcast a reality TV show to track the astronauts' selection and training process (and raise funds for the missions). Lansdorp said Monday that the group is still in negotiations with media companies over the rights to televise Mars One's activities. "We fully anticipate our remaining candidates to become celebrities in their towns, cities, and in many cases, countries," Lansdorp. "It's about to get very interesting." Earlier this month, Mars One unveiled plans for the first private unmanned mission to the Red Planet. With expertise from Lockheed Martin Space Systems and Surrey Satellite Technology Ltd, Mars One hopes to send a robotic lander and satellite to the Red Planet in 2018 as a precursor to their manned missions.